Thunder in the Glens two years ago. Road users are being urged to plan ahead for this weekend’s Thunder in the Glen motorcycle rally in Aviemore. Police have been working with the event organisers and are urging road users to be aware of the rally and plan ahead to keep any disruption to a minimum. 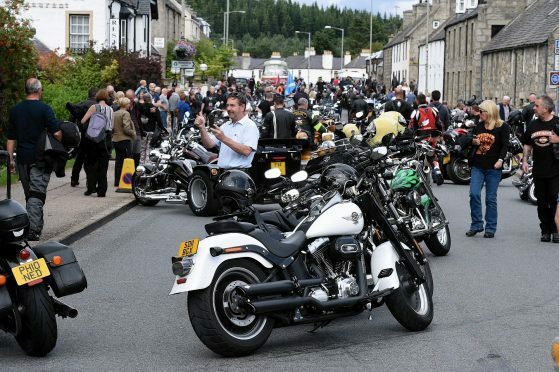 The annual rally brings thousands of motorcyclists to Badenoch and Strathspey for a weekend of ride-outs and social events. The event will run from Friday until Sunday. Inspector Mike Middlehurst said: “We have been working with the planning team for the event and look forward to a safe and enjoyable weekend. “There will be delays for motorists in the area and we ask that you are patient and do not try to overtake and pass the large groups of motorcycles that will be on the road. “During the ride out on Saturday the main A9 Granish junction will be closed for north and south bound traffic between 11.30am and 1pm. “Diversions will be in place for non-rally traffic to enter Aviemore via the south junction on the A9 at Lynwilg. “On Sunday the ride out to Cairngorm will cause delays for traffic in the Cairngorm and Loch Morlich area. “This is a well-established and popular event – we simply ask that motorists leave a little extra time for their journeys and respect the motorcycles. “Parking will be at a premium and spectators arriving for the mass ride out on Saturday are asked to arrive early and respect the no parking along Grampian Road. The peak periods will be between 11am to 4pm on Saturday for the main ride-out from Aviemore and on Sunday between 11am to 4pm during a ride through Glenmore to the Cairngorm Mountain ski centre.